Running stitch, also know as basting, is probably the easiest sewing stitch to learn. It's really just a matter of repeating a simple sequence over and over. 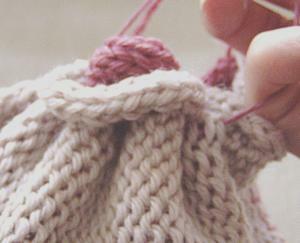 It can also be used as a decorative stitch, as long as you don't pull it too tight then your work becomes gathered. Pin or clip your two pieces of fabric together. Thread your needle and secure the thread/yarn at the right hand end of your work by using 2 back stitches. For gathers - leave a 6 inch tail which you must not pull through. Push your needle through both layers of fabric from front to back, then move your needle towards the left along behind the fabric and bring it back through both pieces of fabric to the front of your work. 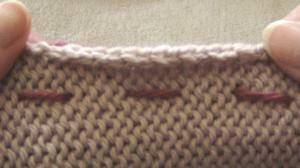 Pull your thread/yarn through to the front too, but don't pull too hard - your work should still lay flat. Try to keep your stitches even. Move another step to the left across the front of your work and then repeat steps 3 - 5 until you've stitched the your pieces together. Finish with two more back stitches to hold thread/yarn in place. For gathers just hold onto both ends of thread/yarn and bunch up fabric so gathers form - finish with 2 back stitches at each end when desired gathers achieved. I told you it was easy. Now try it yourself using these pictures to help you out. This is what the stitch does when you gather it!